I’m doing the 50-Book Challenge again this year. For the challenge, you pledge to read 50 books between January and December – and the website has virtual shelves where you can view the books you’ve read, write a review, and assign star scores. It’s visual and easy to use, and you can create extra shelves for the books ‘to be read’ and ‘currently reading’, too. 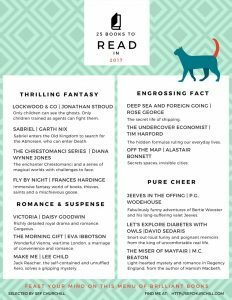 Find out more and sign up here – and as I complete a raft of books for this year, I’ll put the list here on the blog along with my thoughts. Meanwhile, I have compiled some of my 2016 favourite reads. (To see the list, click the image or click Read.) There are 25 books here, across various fiction and fact genres, and every one of them was brilliant. If you’re looking for books to read in 2017 then start here! Having a target makes me focus on reading in every spare moment – instead of other time eaters such as flicking through my phone looking at Facebook, or, the worst, Tumblr. I love Tumblr far too much. I read mostly on Kindle on my phone, but I do have paper books too, from the library and from my inveterate book-buying habit. The more paper books I read, the better it probably is for my sleep/eyes/neck, since I’m not hunched, peering at a blue-light screen. I think we exist in a world of reading all day – but instead of reading 144 characters at a time, or one status update or news snippet or meme at a time, I’m choosing to read books. I’d love to know what you’re reading right now – or what’s on your list for 2017. Do you take part in reading challenges? Let me know in the comments!